"Are churches really prepared for more leaders? I know we need more people, but would we know what to do with them? Most churches have youth pastors who've only been in the game for a couple of years or so. Are they really equipped to prepare leaders to engage for the long haul? We all know how good churches are at burning people out. How much easier is it to burn out people who are fairly uneducated about youth ministry? We need more people but we also need to be serious about equipping them for the long haul if we expect to keep getting new people." Now, that was in October and apparently those questions lingered and those thoughts matured. God was, as they say, laying something on my heart. And apparently God was laying the same thing on a couple other guys' hearts as well. A few months later, a couple of us youth workers in the North County area got together and brought up the idea of creating a collaborative training event for volunteers in small to mid-sized churches (which represent a majority of the churches in America). 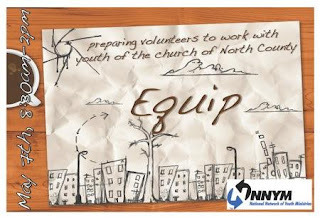 On May 7th, all this is coming to fruition through an event called "Equip"... The name was not my idea (ironically, considering how much I used the word "equipping" in that letter to Mark). I think more areas around the country should begin asking the question, "What if veteran youth workers all over the country... you know, the guys who are writing books and leading huge leadership teams... what if folks like that began training volunteers?" Now, we haven't held the event yet, and who knows if it's gonna work (I think it will, it's a pretty well planned event considering it's our first time doing it), but this is one of those things at which it is worth risking failure. We are the most educated and well-resourced generation of youth workers in history... let's share the wealth!